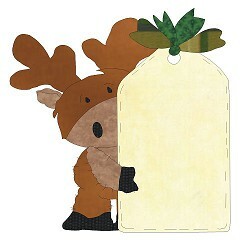 Christmoose was created specifically for tags you place on gifts at Christmas. What a fun and cute way to "tag" your gifts to others and a treasure they'll have for life. This tag is 5x5, slighly large for most tags, but their is no way to downsize this design without losing the integrity.